Showing 1 - 2 of 2 Products for Fog Light Bracket. The 2017-2018 Ford Raptor Fog Light Kit allows you to mount our D-Series (Dually or D2) LED lights in your Fords OEM fog lamp locations. This kit gives your otherwise square D-Series lights a clean from-the-factory look without having to drill or cut into your bumper. Made from high quality stainless steel, these adaptor plates are powder-coated black for a long-lasting finish. This kit comes with everything you need to install 6 D-Series lights in both fog light locations and is backed by Rigid Industries limited lifetime warranty. Fits 6 D-Series. 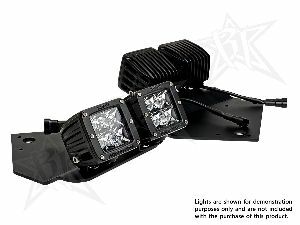 This Rigid Industries fog light replacement kit is designed specifically for the F-150 SVT Raptor and allows for a clean, OE-quality install of Rigid Industries high output lighting. 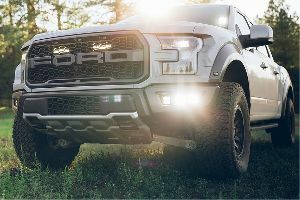 This kit allows you to install two (2) D-Series LED lights (not included) in each fog light opening in the lower front bumper of your Raptor. Made from laser-cut 304 stainless steel, it features a high quality black powder-coat finish. This kit includes a wire harness extension and all necessary hardware, and features Rigid Industries limited lifetime warranty.